When Shankly arrived at Grimsby, the club was in free fall having dropped from Division 1 to regional football in Division 3 in quick time, the morale of the players and supporters was low. However, the players who had been at the club when Grimsby were in the top flight were still there, there being little point in players swapping and changing clubs in those days due to the maximum wage. Shankly was quickly able to use the raw material at his disposal to weld the players into a good side. He quickly became a cult figure at Blundell Park, the team regularly drawing crowds in excess of 20,000. When Shankly turned out for the reserve team, it too would draw huge crowds, 5,000 not being unusual for Shanks who was still more than a decent player himself. 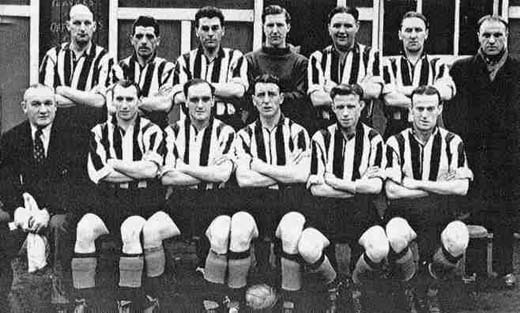 In 1951-52, Grimsby just missed promotion, despite picking up an incredible 36 points out a possible 40 in the last 20 matches. The 1952-53 season started with much optimism around the club but the players still felt the disappointment of the previous season. The team too, was an ageing one, and struggled after a bright start and the season fizzled out. Shankly was given no money to buy new players and was reluctant to blood some promising reserves because of the loyalty he felt to these older stalwarts (a fault that was to surface at Liverpool years later). Disillusioned by events, he quit in January 1954, citing a lack of ambition by the board as his main reason. Remarkably, in his autobiography he was to claim: "That Grimsby team was pound for pound, and class for class, the best football team I have seen in England since the war. In the league they were in they played football nobody else could play. Everything was measured, planned and perfected and you could not wish to see more entertaining football."